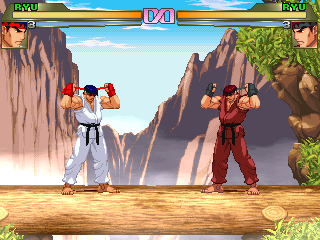 Stages: All of these stages should work with both WinMUGEN and the 04.14 DOS version unless stated otherwise. Some have separate .DEF files to use in specific versions. The file sizes listed are the sizes of the ZIP files. 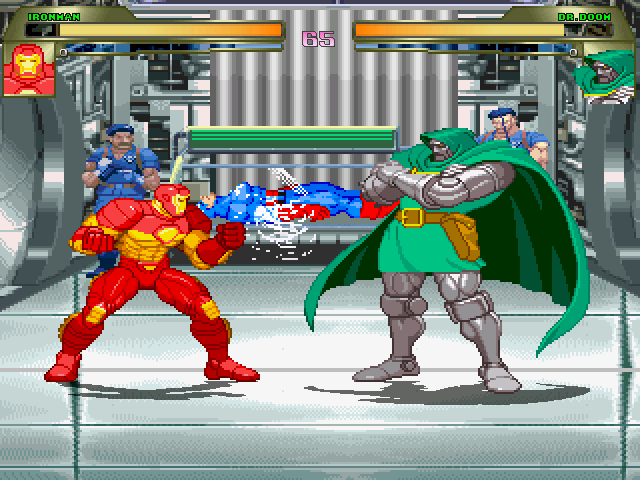 Completely original tribute to Iron Man's Hall of Armors. Has animated lighting and lights, parallax (or rowscroll) floor with transparent reflection. 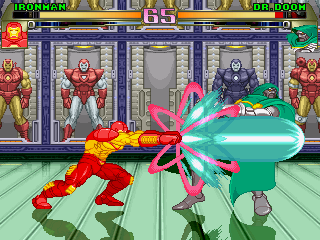 The design is based mostly on the Bob Layton pin-up from Marvel Fanfare #45 but has the cell design from Iron Man 2. Cat's Lair from Thundercats. Animated cameo by-standers and Cat's Signal. Pixel art by Kiwi, coding by Shin Otaru and BGM by Thor Arne Gald Semb who can be found here and here. 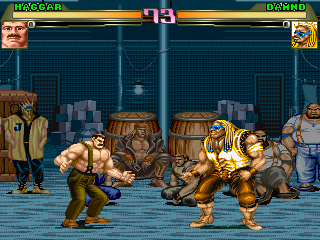 Quickly made stage from Final Fight. Includes various versions for different reasons that I'm too lazy to mention. Windows and DOS versions in same zip download. Stage Dimensions: dimensions ??? x ??? 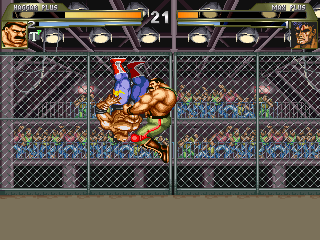 Remake of Karate Champ's 4th stage using Capcom graphics (SFA2, SFA3, XMvsSF & MvsC). 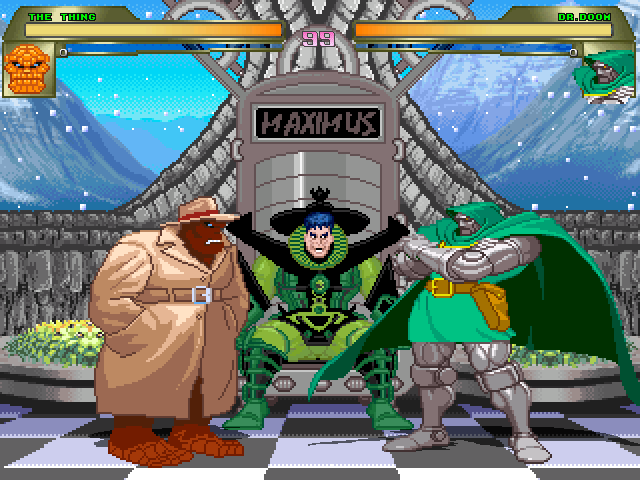 The fog moves and the judge from the game is there despite the fact that this game isn't won on a points system. Updated 2009 Sept. 25th. 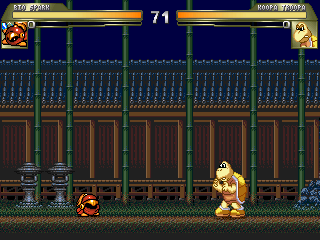 Modified version of the Kirby Super Star tutorial scene. 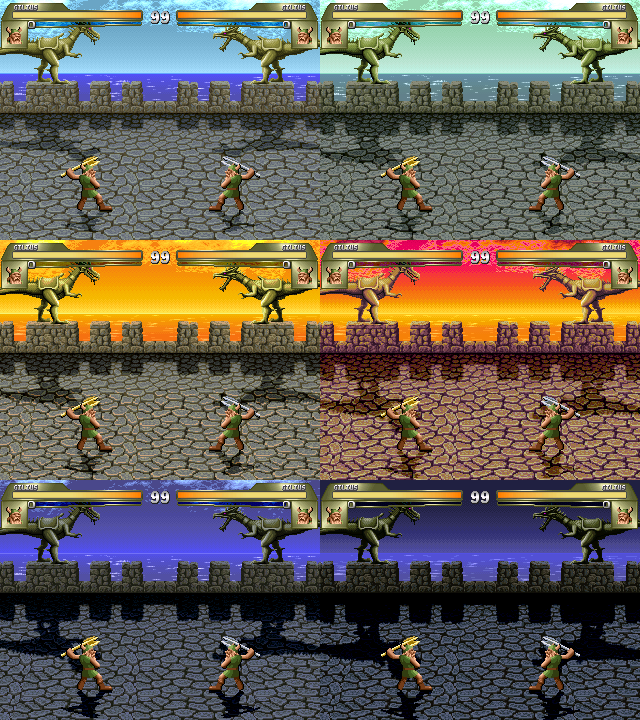 Using pixel editing & math, I separated the curtain shadow from the puzzle background into separate layers. The floor is parallax. Stages 5 (pictured), 13, 25 and 37. 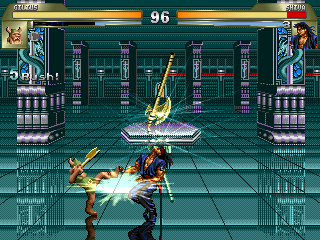 These had to be edited just to fit minimum MUGEN standards and for moving clouds on stage 5. 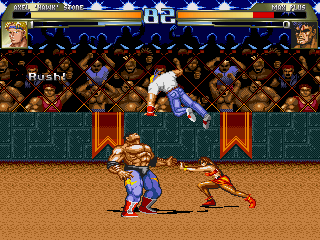 Its high zoffset (to match the game) may make it tricky for larger characters, but most larger beat-em-up/side-scroller characters work well with this one. 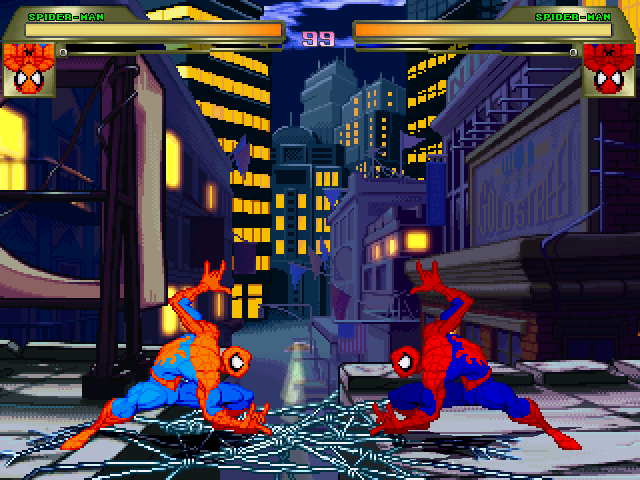 A 2008 update of my old night edit of Spidey's MvsC stage. 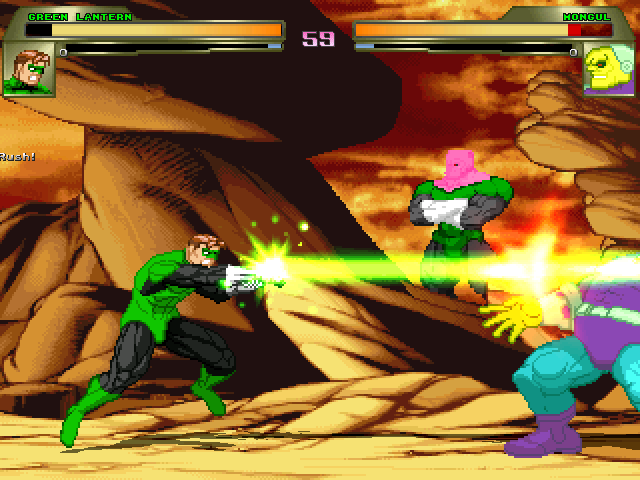 All the graphics were improved and the SFF was recompiled with fixed transparencies. 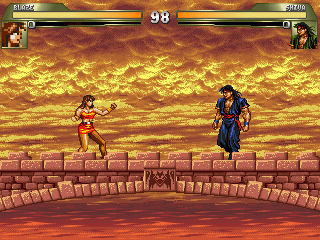 An updated version of first stage from the Revenge of Shinobi for the Sega Genesis. Separated a few background items to add extra layers of scrolling. Includes animated leaves and moon. 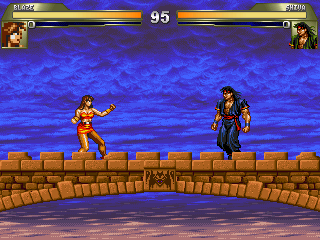 One of the boss fight stages from Jaleco's Rushing Beat Ran a.k.a. Brawl Brothers. 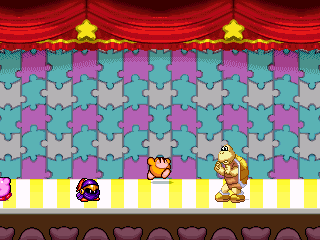 Slightly edited to make the stage a bit taller. 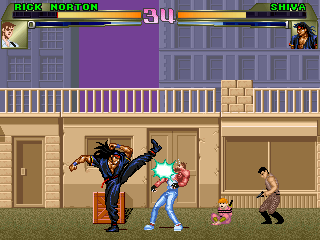 The entire first section of Mission 1 from the arcade version of Shinobi. Includes animated drone enemies and hostages. 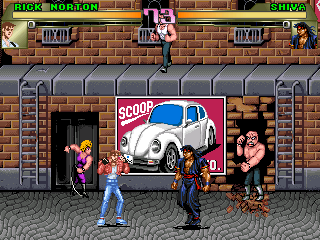 A conversion of where you fight Abadede in Streets of Rage 2. 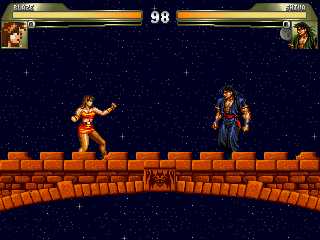 I only made the stage a bit taller (to fit the MUGEN screen) and added a slight bit of depth between the fence and the crowd. 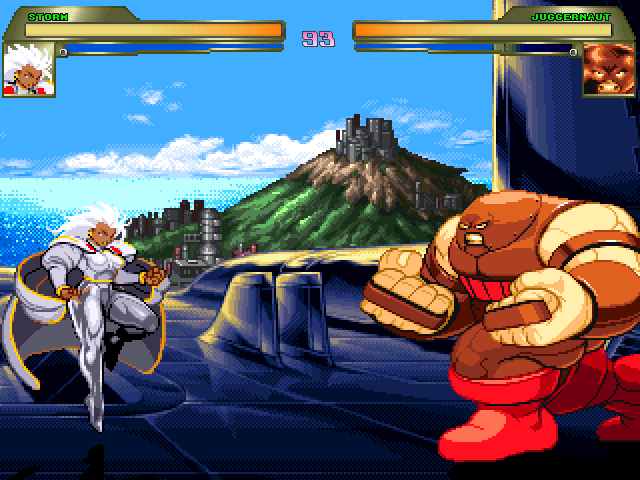 Custom MUGEN X-Men stage with the Blackbird making a friendly stop in Genosha. 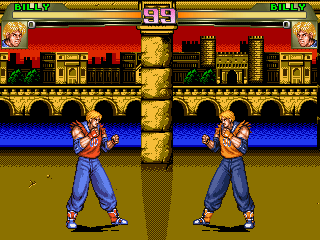 Sprites and sprite editing By Warmachinex and stage coding by By Magus. 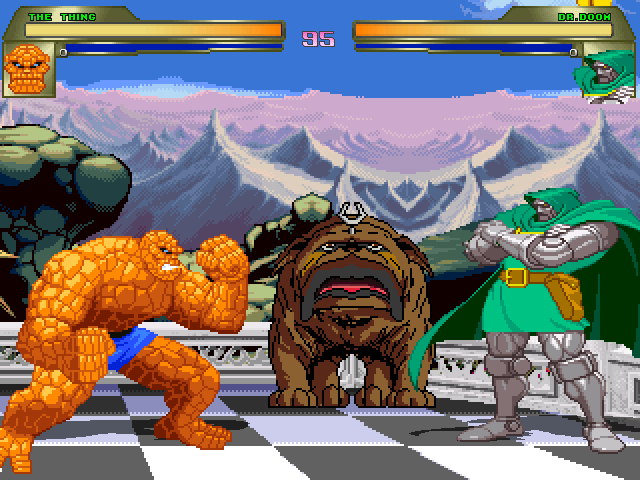 Custom stage based on the Inhumans from Marvel Comics. 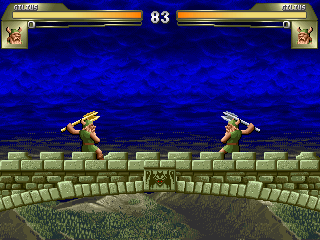 Sprites and sprite editing By Warmachinex with Maximus edits by Kal. Stage coding by By Magus. 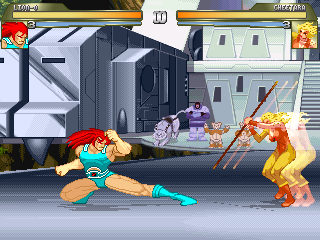 Custom MUGEN stage based on X-Men:Evolution episode. Sprites Concept By Warmachinex. Additional Sprites & Coded By Magus. Custom G.I.JOE Mugen stage based on the USS Flagg. 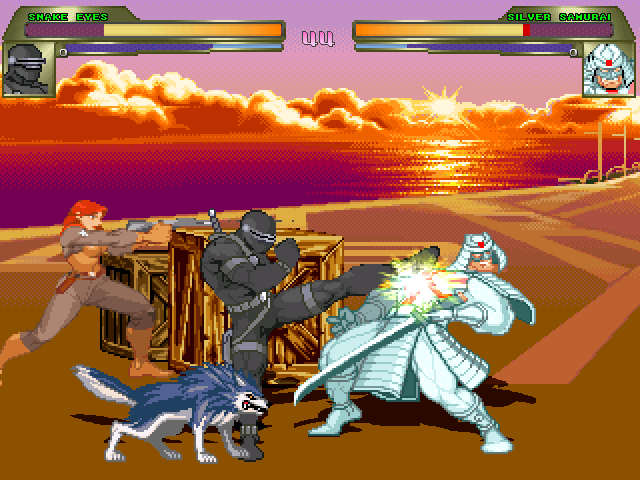 Features animated gunfight between Scarlett and Cobra Troopers. By Kiwi, Magus and Warmachinex. 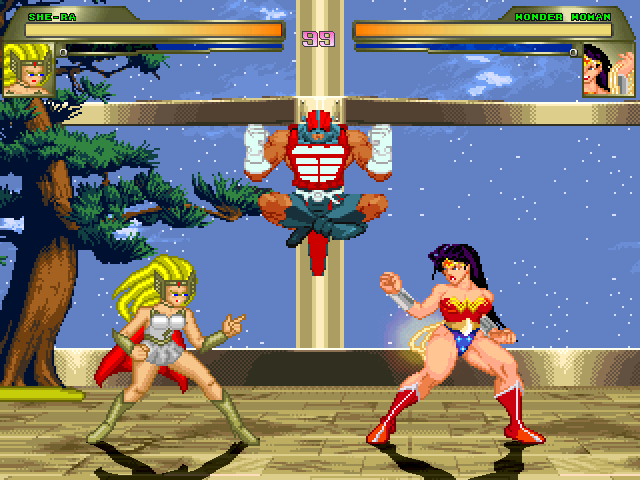 Custom Mugen stage based on Masters of the Universe. Sprites Concept By Warmachine & Coding By Magus. 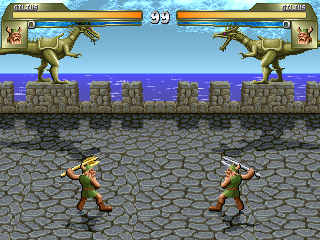 Zodac and Weapons rack sprited by Kiwi.